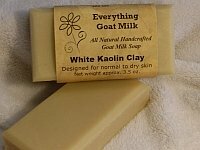 White Kaolin Clay Goat Milk Soap has a refreshing all-natural grapefruit/peppermint scent, and includes white kaolin clay to gently stimulate circulation. White kaolin clay is the mildest of clays and can be used even on dry or sensitive skin. It helps gently exfoliate, stimulate circulation and cleanse skin without drying. In addition to bathing, this also makes a very nice facial soap for those with normal or dry skin. Ingredients: goat milk, olive oil, palm oil, coconut oil, sodium hydroxide (lye), castor oil, shea butter, avocado oil, fragrance, kaolinite (white clay), sucrose, sea salt. Net weight 3.5 oz.